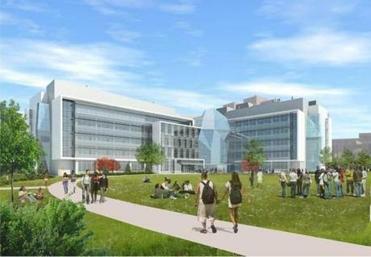 The science complex under construction at UMass Boston is expected to be completed by 2014. The university also plans to add academic buildings and dorm rooms. For decades, Columbia Point was an isolated peninsula of Boston that failed to attract much in the way of new development, despite its location on a prime strip of waterfront overlooking Dorchester Bay. But a burst of building activity now promises to transform many of the area’s stubbornly underused and vacant properties into new housing communities, retail stores, restaurants, and striking academic and cultural buildings. In the past few weeks developers have filed plans for more than 450 apartments on ­Morrissey Boulevard and Mount Vernon Street. University of Massachusetts Boston is in the midst of a $700 million ­expansion, Boston College High School is proceeding with a new arts and athletic center, and the Edward M. Kennedy Institute for the United States Senate is under construction near the waterfront. City officials are also planning to build new roads and add bike lanes and walking paths to improve circulation around the neighborhood. The 400-acre peninsula ­already hosts more than 1,500 mixed-income housing units that replaced the former ­Columbia Point housing development, which was notoriously violent and nearly uninhabitable by the time it was demolished in the mid-1980s. ­Although the area has come a long way since then, plenty of work remains. While it is served by an ­MBTA station, with easy access to Interstate 93, Columbia Point still feels cut off from the rest of the city, partly due to the wide roadways that bisect the area. It has few retail options, and its picturesque waterfront is hidden behind buildings that do not always take advantage of the views. A 2011 master plan commissioned by the Boston Redevelopment Authority calls for a mix of commercial and residential redevelopment on several properties between I-93 and the waterfront. The plan emphasizes the need for ground-floor retail shops and restaurants to create more active commercial streets. It also calls for towers up to 17 stories high next to the JFK/UMass MBTA station, with the buildings to step down in height as they get closer to residential South ­Boston. Planned transportation improvements include extending Old Colony Avenue to the T station, and construction of a new street that would run from the Shaw’s Supermarket across Morrissey Boulevard to Mount Vernon Street. That street would continue to Day Boulevard, providing an alternative to the often-clogged elevated traffic circle at the entrance to the neighborhood. The first major project near the MBTA station was submitted last week by developer ­David Greaney of Synergy ­Investments, which wants to build 278 apartments on a weed-covered lot along Morrissey Boulevard next to Shaw’s. The $60 million project would include two 5½-story buildings, a courtyard, gym, club room, and parking garage. Rents for the apartments — a mix of studios and lofts, and one- and two-bedroom units — are expected to range from $1,200 to just over $2,000 a month. Greaney, whose company also owns the Shaw’s plaza, said he hopes to add a second phase that could include more housing and additional retail stores. And just a few yards down Morrissey Boulevard car dealer Herb Chambers wants to open a BMW dealership on the former Channel 56 property next to The Boston Globe. Meanwhile, over on Mount Vernon Street, developer Corcoran ­Jennison Cos. is proposing to build 170 apartments on a parking lot in front of the company’s office building. The six-story complex would include a mix of studios and one- and two-bedroom units, underground parking garage, and ­retail stores at street level. The company was a pioneer in Columbia Point’s redevelopment, building the 1,280-unit Harbor Point housing community and the 335-unit Peninsula apartment complex at 401 Mount Vernon. Michael Corcoran said he hopes this next wave of building will bring new shops, restaurants, and entertainment to the area. The UMass expansion will bring a new building at the gateway to the campus, a sleek, glass-walled science center that is expected to be completed by the fall of 2014. The university is also planning construction of two other academic buildings and about 2,000 dorm rooms over the next decade or so. The plans include transportation improvements and construction of a large green or quad at the center of the campus. The Edward M. Kennedy Institute, next to the JFK ­Library, is expected to open within two years, and should ­also bring more students, tourists, and residents to the area. Among the uncertainties is what UMass will do with the adjacent Bayside Exposition Center, which it acquired out of foreclosure in 2010. The university is only now considering plans, including one to turn it into a health and science center with classrooms, laboratories, and recreation space. In the short term, the property will be used for additional parking.